2011 will be known as the year connected TVs came of age. Although web access on television sets isn't a new thing, making a service that works for and not against the consumer is. 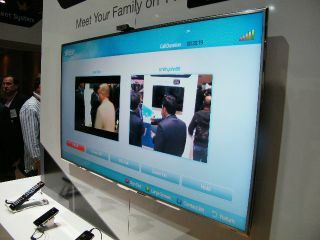 Samsung's Smart TV range has grown rapidly in 2010 and this has brought with it some exciting enhancements in the connected TV space. The Samsung Smart Hub has had a massive overhaul and is now an exciting proposition for using the web through a TV. The first main difference is that everything is now much easier to get around. The Smart Hub has separate places for apps, social networking and on-demand TV but this is all interweaved with the use of its universal search function. So if you want to watch a movie, it will scour all the places you can find this movie on-demand through the myriad app and web services and come up with a simple thumbnail list of where you can get the content. You can also search services by keyword. So if you want information on sport, then use this keyword and you will get Twitter based content, Facebook pages, YouTube videos and the like. The search functionality works really well and ties the whole service up nicely - couple this with full web access and the hub is a decent portal to a controlled web experience on a television. Other new features include picture-in-picture functionality. This allows you to check Twitter and Facebook while still watching the TV screen. This is a massive help for those who want to make their TV watching experience social. Having the live Twitter feed up against the TV content means you can keep track of many things at once on the same screen. All of this functionality wouldn't be complete, however, without a device to navigate this content on. This is where the TwinView Touch Control TV remote comes in. Complete with a 3-inch screen and bustling with functionality, the remote can access the web and can pipe out one television feed on its three-inch screen while you're watching another on your big screen. The remote control has all the functionality of a PMP and looks like a smartphone and it is a great addition to the Samsung TV line-up. Samsung seem to be branching out on its own with Smart TV and its service looks like a decent rival to the upcoming YouView and Google TV. Once Samsung offers up paid apps as well as free ones, Smart TV will become quite a dominating force in the on-demand market. The Samsung Smart Hub will be available on Samsung's latest range of connected TVs.